In what is hoped to be the first example of its kind in the South African Vampyre Community, the House membership will consolidate its VC-related assets into one grouping, creating something not unlike a conventional family structure, and harking also after similar House/Coven structures abroad. In 2010, Octarine Valur founded the House Valur and since then has taken several Fledglings under her mentorship. Of those she mentored first-hand, and also those mentored by her childer – including Covens thus far founded by them – will henceforth, by mutual agreement, be linked to the House. The bond uniting the House is the bond of family. A family stands together, protecting one another, promoting one another’s interests and nurturing one another. 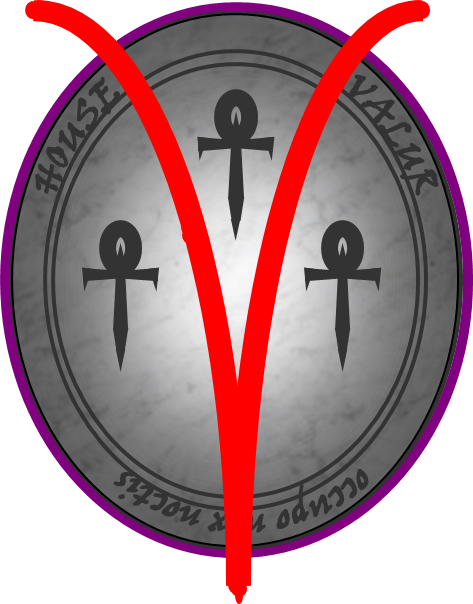 In simple terms, this means that House Valur will no longer be a simple membership-only organization, but will now contain the entire lineage of Octarine Valur, and that all of these individuals will be adding the name ‘Valur’ to their Vampyre names to denote their membership in this family. Coven d’Eir, a prestigious group in its own right – with an impressive reputation in local VC and Pagan social circles – is now also linked to House Valur by ties of blood, and although it will not be an integral part of House Valur in an organizational or hierarchical sense, it will be part of the House in terms of all its members being part of the Valur family and bearing the Valur name. Very important to mention, is the point that this Coven will not however, forfeit in any way its own unique identity or right to act in its own interests. This grand unification symbolizes a consolidation of the House itself, and also a reaffirmation of the House system in the South African Vampyre Community. As a unified House, we wish to see other Houses, Covens and groups in our community follow our example in what we believe to be a big step forward in building our local community. This entry was posted on Tuesday, July 21st, 2015 at 11:27 am	and tagged with dagan valur nightalon, house valur, kay valkir, Lunah Valur Eir, Octarine Valur, Psion Valur, scarlet valur storm, serephim eamen nereza and posted in News. You can follow any responses to this entry through the RSS 2.0 feed. cos we’re all so awwwwwwwwwwesome!